Name: This is the Cache Identifier name and should be unique for an Amazon EC2 region(per account). Number of Nodes: Number of Node types you want the Amazon ElastiCache Cluster to launch. There is a limit to Cache nodes you can launch per account. Please increase this limit using ElastiCache Limit Increase Request form. 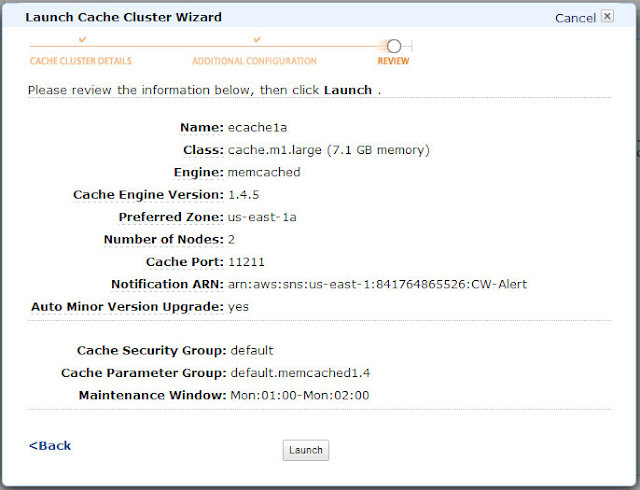 Engine: Currently only MemCached, I assume AWS Team will adding new cache engines in future. Cache Port: The default port 11211 in which the Amazon ElastiCache node accepts connections. Topic of SNS notification: Lets you specify whether you would like to receive SNS notifications related to your cache nodes/cluster using Amazon Simple Notification Service (SNS) system. You can either select an existing SNS topic or disable notifications completely as well for the entire Amazon ElastiCache Cluster. 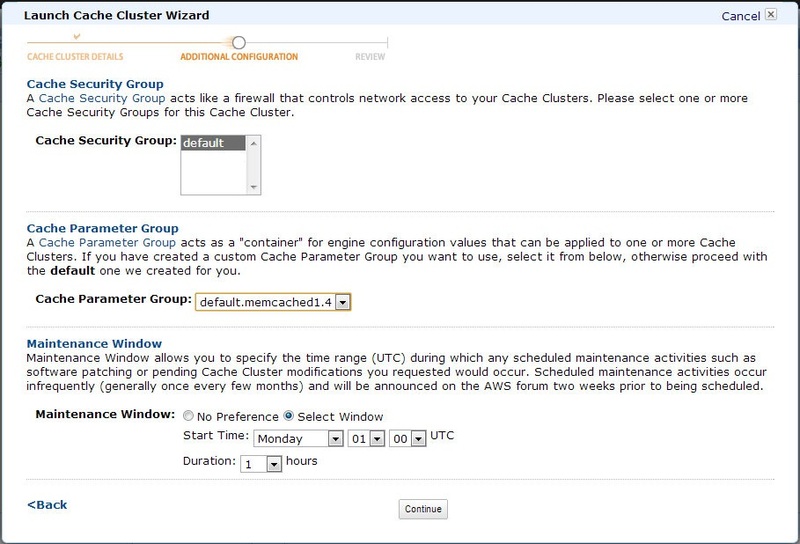 You may need to configure the Cache security group and Parameter group for your Amazon ElastiCache Cluster in this section. The Cache security group will allow request access between your EC2 instances and ElastiCache Nodes. The Security group of your EC2 instances should be added in this ElastiCache Security group for opening the access. 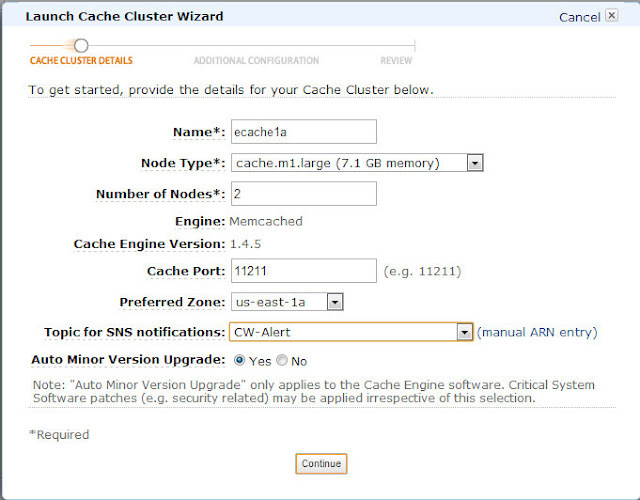 This setting applies to all the existing and new cache nodes inside the Amazon ElastiCache cluster. You can either create a new Amazon ElastiCache Security group or make changes in the default security group as well. In case you have Multitude of cache clusters with variety of EC2 tiers accessing them on various workflows I would strongly recommend creating your own cache security groups as best practice. Currently Amazon ElastiCache cannot be accessed outside Amazon EC2 (It does not make sense unless you have Gigabit NW to make productive use of Cache with low latency). Also in future, we can expect Amazon ElastiCache to work inside Amazon Virtual Private Cloud (VPC) network as well. 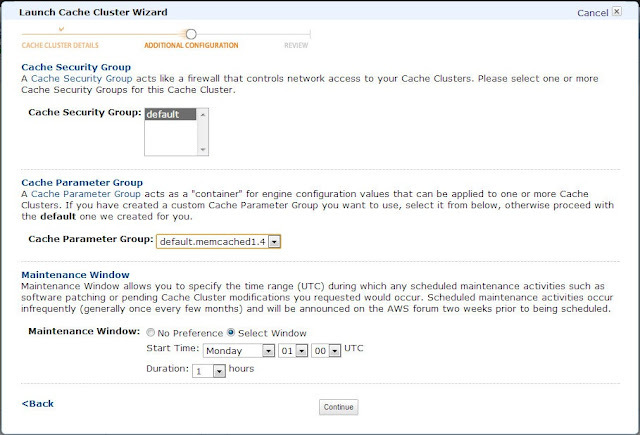 Cache Parameter Group: You can either create a new parameter group or use the default memcached parameter group. AWS provided default will suffice for most use cases. The parameters will be applied to all the cache nodes in the Amazon ElastiCache cluster. Maintenance window: Amazon ElastiCache is a Managed service and AWS team will take care of certain routine management activities without your intervention automatically. Maintenance window is one such period in which AWS team will carry out scheduled maintenance like software patching in this configured time. In case your instances are rebooted after the maintenance window period, the cache node(s) have to be properly warmed. Since Amazon ElastiCache currently relies only on RAM which is ephemeral in nature, such cold state is unavoidable. If you have multiple Redundant ElastiCache clusters in Multi-AZ you can rotate the maintenance window to your advantage and keep the cache entries warm in your cache nodes. Refer URL: http://harish11g.blogspot.in/2012/11/amazon-elasticache-memcached-ec2.html to know more about this technique. Review your configuration and proceed to launch. In case any of the details configured need to be modified you can always go back from this screen. Usually a launch of 5 X cache.m1.large nodes in US-East will take around ~320 seconds. This may vary time to time depending upon the cache node type, number of cache nodes and Amazon EC2 regions in consideration.